Until very recently, communities of Latinos have lived and worked in the South Carolina Lowcountry in relative obscurity. Their presence has been largely overlooked by the English-language media and area policy makers. This exhibition documents their little known history, drawing on oral history interviews conducted from 2012 to 2014. The interview recordings and transcripts, supplemented with photographs, historic documents, and artistic images, speak to their many achievements and contributions to the region's cultural and economic life, as well as their struggles with poverty and discrimination. The exhibition also captures a critical moment in the historic evolution of the Latino communities of the Charleston area. Their growing public presence in business and the arts suggests that Latinos represent an emerging political and social force in the region. However, national political trends, including the resurgence of white nationalism, make their continuing progress uncertain. 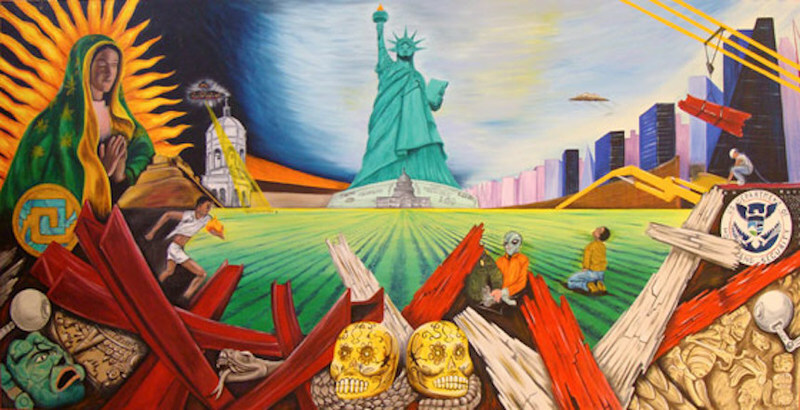 Guadalupana Torch, painting by Cornelio Campos, Durham, North Carolina. Since the 1960s, thousands of natives of Mexico and Central America have worked in local agriculture, harvesting vegetables as seasonal laborers on Johns Island, South Carolina and other area farms. Some have chosen to remain here and found permanent employment. Over the years they were joined by smaller communities of Puerto Ricans, Argentinians, Colombians, and Brazilians. 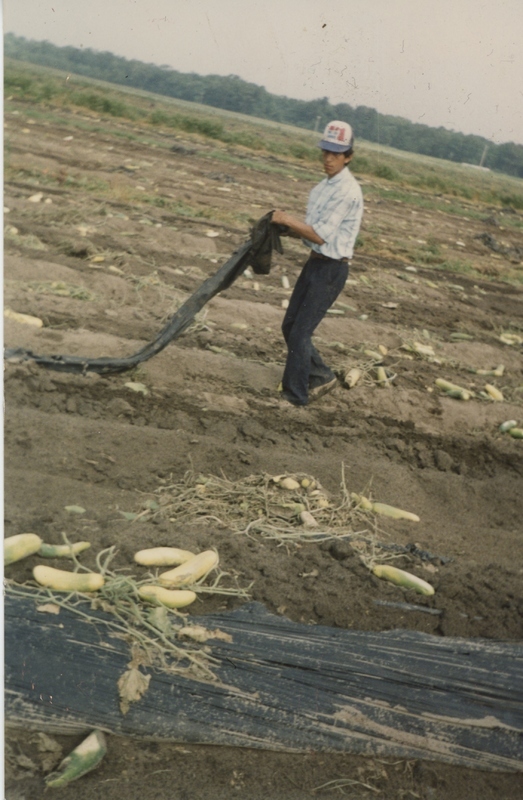 Agricultural worker, Wadmalaw Island, 1996, courtesy of Marina López. Worker removes black plastic used on fields to help retain soil moisture and improve weed control. The Johns Island tomato sheds that drew the earliest waves of Latino immigrants to the region have mostly closed down, and local farmers have struggled to compete with the prices of tomatoes grown in Florida, Canada, and Mexico. The economic recession of 2007-2009 also stalled the influx of newcomers. However, in the past two decades new groups of Latino immigrants have been lured to the region by job opportunities beyond agriculture—including construction, domestic services, and the tourism and hospitality industries. The 2010 Census indicates that nearly 236,000 Latinos live in South Carolina with about 36,000 making the Tri-county region (Charleston, Berkeley, Dorchester counties) their home. These numbers almost certainly represent an undercount, as many undocumented Latinos are likely missed by census takers. Regardless, between 2000 and 2010 South Carolina’s Latino population grew 154%. This represents one of the fastest growth rates in the nation, second only to Alabama. All indicators suggest that the Latino population in South Carolina has continued growing since 2010. Las Voces del Lowcountry emerged from Marina López’ work as a counselor to Spanish-speaking immigrant families in the Charleston area from 2000 to 2012. López was struck by the contrast between her clients lives and the stereotypical and spiteful comments that dominated public discourse around issues of Latinos and immigration. She began exploring ways to document the experiences of local immigrants using their own words. As an immigrant herself, López was interested in learning how their stories of pain and struggle, as well as resilience and hope, could become part of the fabric of the region’s collective memory. 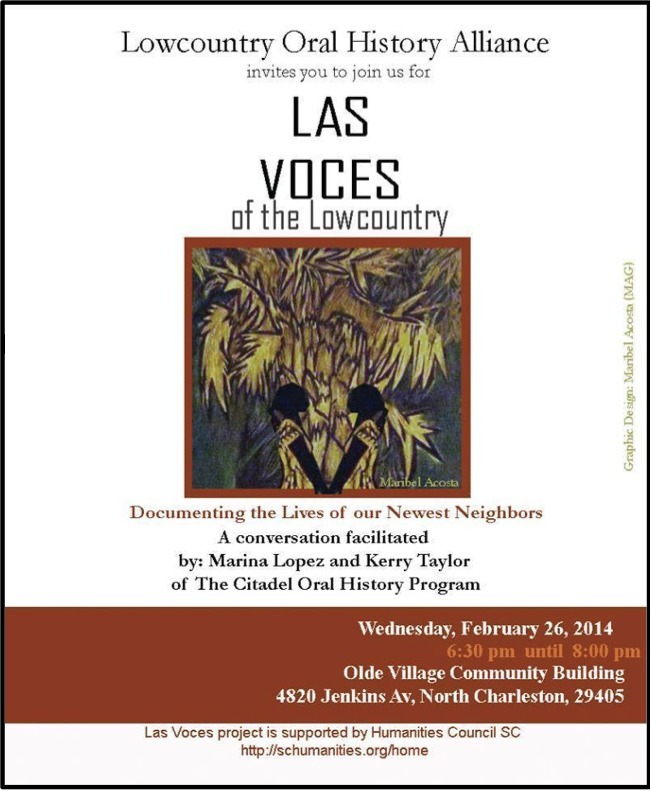 Flyer for "Las Voces del Lowcountry," February 26, 2014, courtesy of The Citadel Oral History Program. During this program, Marina López and Kerry Taylor discussed the topic "Documenting the Lives of Our Newest Neighbors." In December 2009, López attended an oral history workshop at The Citadel facilitated by Kerry Taylor. Since then they have partnered to collect, preserve, and share the recorded memories of the Latinos residing in the Lowcountry. Their initial efforts focused on the experiences of working-class immigrants, most of whom were from Mexico. They quickly expanded to include interviews from the diverse Latino communities of the region. Their goal from the start has been to deepen awareness of the varied experiences of area Latinos and to enrich public discussions regarding relevant policy issues such as immigration, education, and employment. The interviews in this exhibit highlight three themes: the experiences of working class immigrants and their children, the impact of immigration policies on their lives, and the emergence and development of Latino social and political organizations. In 2013, The Citadel Oral History Program received funding from The Humanities Council of South Carolina which supported the recording of additional interviews and sponsored community programs to encourage open and civil dialogue. Of the thirty interviews gathered by the oral history program staff, thirteen are featured in this exhibit. The full transcriptions and audio recordings are available to the public through the Lowcountry Digital Library.